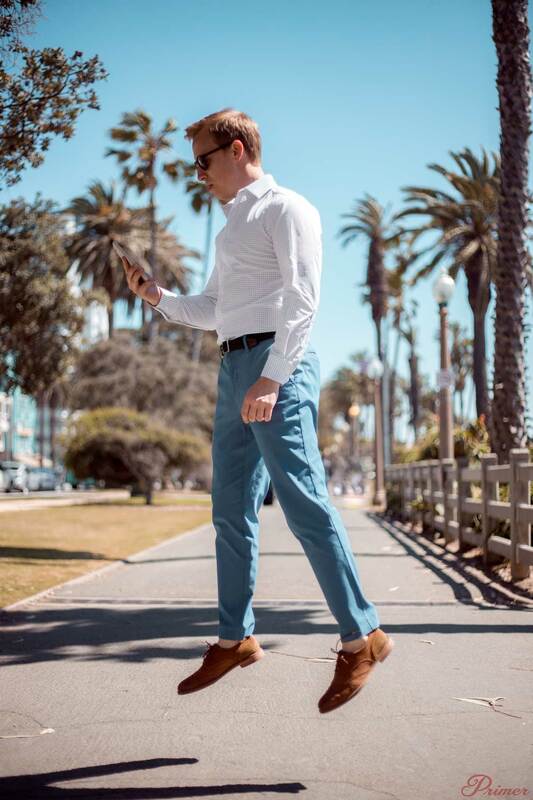 We've teamed up with Mizzen+Main for this post, the innovative brand making moisture wicking, machine washable, four-way stretching, wrinkle resistant American-made menswear. Click here to see their line! We’re in that period just before the change of the seasons – a liminal, anticipatory moment – when your brain can sense spring is about to drop. With spring comes renewed energy for adventure, fitness, dating, and long days hanging with friends. Whether you need to refresh your basics by picking up a new pair of shorts, or up your work-casual game with a couple new button-ups, get a new piece for an upcoming adventure in a new city, spring is a chance to inject some color and boldness in to your wardrobe. Traditional clothing is not optimized for sweat and range of motion. Beyond that, by the time you've got your shirt tucked in and your shoes tied, you're already covered with wrinkles. It's time our clothing started working with us. 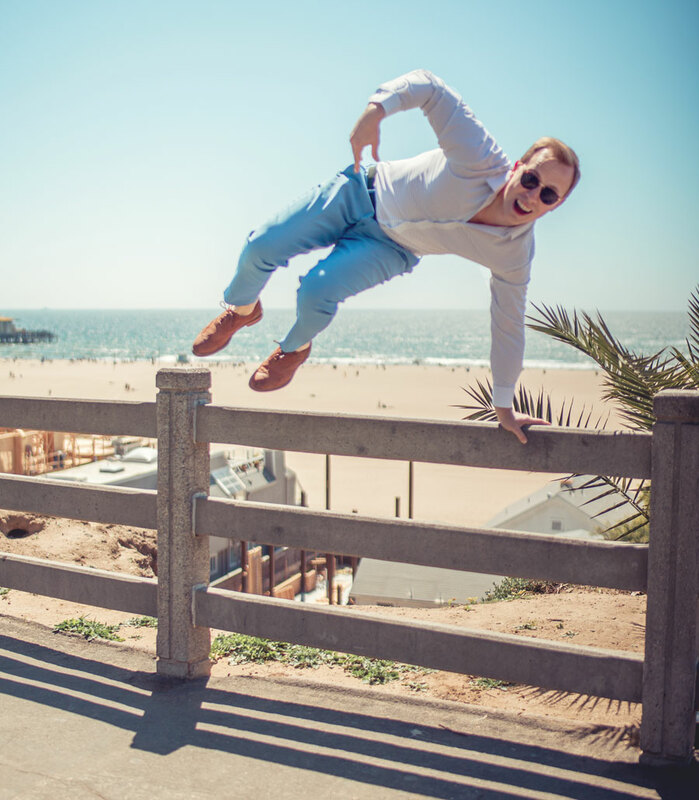 Mizzen+Main is a menswear company updating the classics with performance fabrics and a focus on design-forward, athletic fit. The question is, what does “performance” mean? Let’s break it down. Outdoorsmen say “cotton kills” because it soaks up moisture and retains it; not good if you’re on a windy mountainside in the rain. Also not good if you need to perform at your job and don’t have the bandwidth to worry about soaking through your shirt on a July day or during an important presentation. Why highlight this? A confession: I’ve traditionally had a moisture-management issue at work. If you’re in any kind of collaborative, demanding career you know: the most stressful part of your day isn’t getting to work, getting to the gym, or your personal relationships – it is work. Whether it was dealing with an (ahem) challenging personality, performing in a meeting, or burning the midnight oil to meet a deadline I’ve often found myself sweating in a perfectly climate-controlled office. Kennedy button up / Deputy chinoSweat. It’s a natural physiological response to stress, but it wreaks havoc with feeling fresh, odor-free, and confident. This is where Mizzen+Main’s moisture wicking fabric comes in to play. It's a blend of synthetic fabrics, which convey moisture away from the skin – something traditional cotton fabrics don’t do well. Check out the Kennedy button-up. It’s a classic dark-blue window pane pattern whose wicking fabric removes the concern about moisture management once and for all. Work sweat-ers, rejoice. Traditional cotton is soft and drapes well but offers virtually no give for movement-intensive applications such as climbing stairs or wending your way through a foreign city on your way to dinner. Mizzen+Main addresses the movement issue with four-way stretch fabric that makes their line far more functional than traditional menswear. The Deputy chino benefits enormously from this innovation. They’re stretchy in all the right places (knees, rear-end, hips) while still retaining the supportive drape of cotton chinos. Also noteworthy is the appealing slate blue – distinctive and fun without being showy. Here at Primer we’ve sung the praises of custom-fit menswear many times. We undoubtedly will again. But bespoke menswear comes with a singular drawback: much of it is dry clean only. 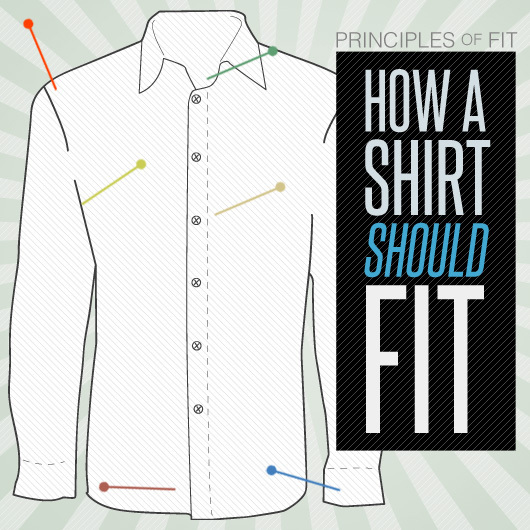 Adhering to their function-first design philosophy, Mizzen+Main clothing is machine washable and wrinkle resistant. This is particularly helpful for spring adventures and getaway workcations, where you need to both pack light and look good out of your suitcase. The workhorse of the casual wardrobe is the short sleeve shirt, and it’s not something you want to worry about being wrinkly or needing to dry clean. Mizzen+Main excel in this category, with the Denali shirt being a stand-out. The cut is athletic, simple, and understated. Form, meet function. 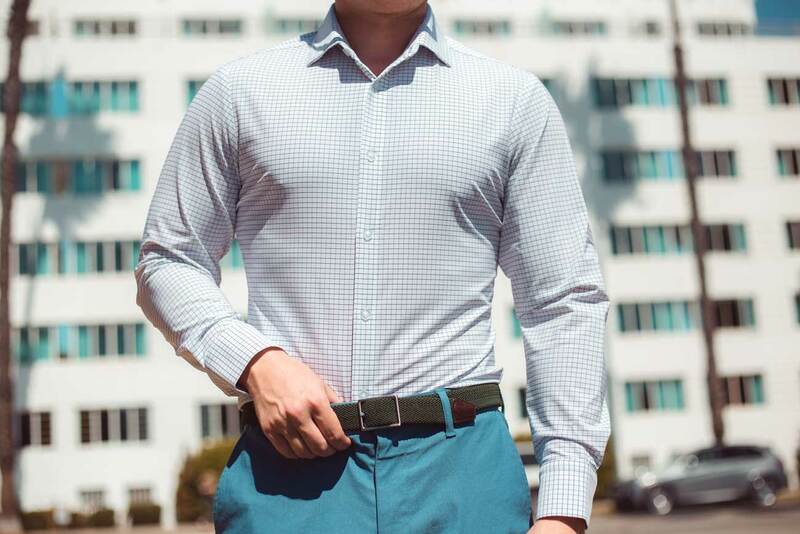 Mizzen+Main uses the standard S/M/L/XL, but make this traditional template more flexible with four options: Standard vs Tall length and Trim vs Standard fit. So whether you're tall and thin like me, shorter and broader like Andrew shown here, wear your shirts tucked or untucked, you’ll be able to tweak the options for a sound fit. All things considered, Mizzen+Main makes it easy to travel, move, and stay dry and fresh, all without sacrificing style. 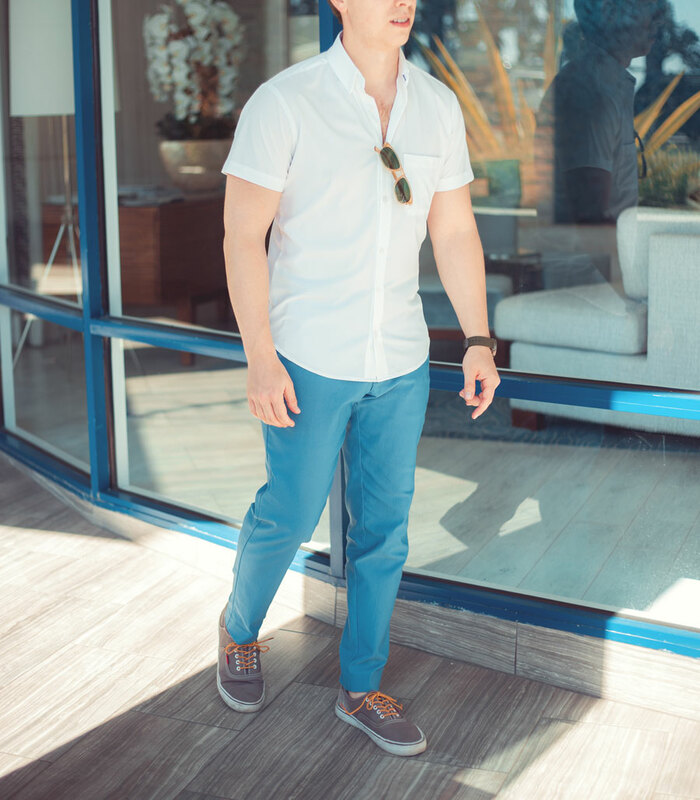 On the style front, it’s worth pointing out that Mizzen+Main offers more bold colors & fashion-forward patterns than many of their technologically-comparable competitors. Just take a look at the range of button-ups available. We also like the slightly preppy, New England vibe the brand conveys. It speaks to an understated quality that pairs well with the tech-heavy features of each piece. Another thing to note is that Mizzen+Main is 100% American-cut and sewn, a rarity in these times of globe-spanning manufacturing chains. 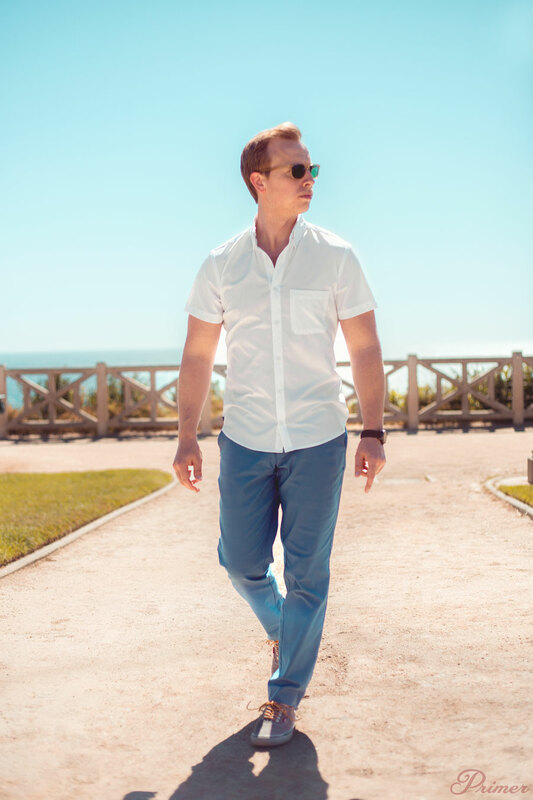 Click here to check out the full line from Mizzen+Main! Do you have experience with Mizzen+Main? Share it below! What shoes are you wearing paired with the Kennedy button up? I also would like to know. I figured you would have an answer by now. Hopefully Andrew will let us know. Hi Derek, Please see my comment above! Not knocking M&M bc I think their stuff looks great. Not in the typical primer budget that I appreciate. Whoa! No kidding! For the price of most of those shirts I can get at least 3 really good quality ones. You can definitely find similar styles at cheaper prices, but the benefit of M+M is the moisture wicking, 4 way stretch, American-made and other benefits of the performance fabric. If those things aren’t issues for where you live/your life then the others may work, but I know a lot of Primer readers live in hot/humid areas or have to move a lot for their work and looking/feeling great is hard in more traditional options. A pair of performance fabric joggers at a place like Gap can even be $70, so for more workday essentials the prices seem to scale appropriately. Just like featuring $300 Red Wings or $50 JCPenney Staffords, we find brands that are worth the money so you guys can pick the options that work best for your needs. I took the plunge on the Red Wings, they were worth it. What shoes are paired with the Kennedy Button up? I have the chinos and one dress shirt. Can’t recommend the chinos enough. They are unhemmed so you have to get them tailored, but that means tall guys like myself can actually wear these. The fabric is crazy comfortable. The pants were worth the price for me, the dress shirt not quite as much. The button downs look great, but the sizing is unfortunately way off for my body. I’m 5’8″ and even when I was perfectly fit and in the 180 lb range, my neck is closer to 17″ and the Medium sleeves are a little short for my arms. I’m wondering how difficult the bottom would be to tailor for length, perhaps I could get a large and get them shortened so I could still wear untucked? Yeah you can have shirts shortened, I’ve done it before. You can’t take too much off because sometimes the proportions will be off in relation to the collar size/position and the bottom hem. I agree…..the problem I had was I loved the shirt & material, but the small was too tight around the mid section (I’m 5’8 and 157 lbs…the arms & neck were perfect)…but the medium fit better around the mid, but the arms were so baggy that it looked funny, even if tailored. They need to pay more attention to the little details of appropriately tailored shirts with each size or they will not survive. Quality & £ is not a necessary duo! It’s like Lady D. & Prince of Wales! People like the first but not the second! check here Lady D. & Dodi al Fayed, quality and feew money!